Gujarat has been one of the most economically advanced states of India. Especially, the industrial growth of the state has remained notable. As a result of this development, the per capita income of Gujarat has remained higher than the national average. This article pertains to evaluating the development of Gujarat with respect to production of goods and services and its overall income. It provides an in depth comparative economic and partially political analysis on the basis of the last 50 years’ historical perspective. Moreover, it also examines contribution of various sectors to the economy of the state. The analysis leads to a definite conclusion that the claim that Gujarat developed only during the regime of Narendra Modi is completely hollow and far from reality. 1. It cannot be said that rate of growth in the state was always positive. Six years during first two decades registered a negative growth rate. During two years of the 1970s the growth rate was declined with double digits. It came down by slightly more than 20 per cent during 1972-73. 2. Only five years in two decades since inception of Gujarat in 1960, registered growth rate with double digits. The highest growth rate of 28.50 per cent was noticed only in 1975-76. The Congress ruled during the most part of the first two decades. However, Babubhai Jashbhai Patel led the Janata Morcha government twice during 1975-76 and 1977-80. The highest growth rate in 20 year period was noticed only in those years. It needs to be noted that it was period of emergency imposed by Indira Gandhi. 3. In the last three decades, growth rate was negative in two years. In fact, during this period the state never underwent a high negative growth rate as it did during the initial two decades. It would mean the economic growth of the state was sustainable and it had acquired capabilities to absorb the economic shocks. There never was a year of negative growth rate since year 2001. Note :1. 1960-61 to 1970-71 figures are at 1960-61 prices. 2. 1971-72 to 1979-80 figures are at 1970-71 prices. 4. During 1980 to 1990, the state attained double digit growth rate in four years while it experienced double digit growth rate in six years in subsequent decade. Gujarat experienced faster pace of growth during 1980s when Madhavsinh Solanki and then Amarsinh Choudhary, both of Congress, led the state government. In this period, the state had highest growth rate for its SDP. Notably, the decade of 1990 saw six chief ministers in the state. 5. The state experienced the highest annual economic growth rate of 19.5 per cent during the six year period of 1988-94. Since then this much of high rate is never attained. This period includes the reign of later years of Amarsinh Choudhary and initial years of Chimanbhai Patel. As against this, the highest rate of growth during the Narendra Modi era was only 14.77 per cent in 2003-04. 6. During five decades of its existence, the state of Gujarat had experienced 20 per cent or more growth rate only during six years. It had crossed marvelous 40 per cent in 1988-89 and it was more than 30 per cent in 1992-93 when Amarsinh Choudhary and Chimanbhai Patel ruled the state respectively. However, there is not a single year when the growth rate is more than twenty per cent since 1993-94. In fact, it reached up to 19.33% in 1996-97. Barring it, the the SDP growth rate has never been more than 15 per cent during 1992-93 to 2008-09. In other words, the Narendra Modi era has never reached the high growth rate of SDP that was achieved earlier. Table No. 3, derived from Table No. 1 and Table No.2, gives details of growth rate attained during different political eras in the state of Gujarat. Table No. 4 reveals that the highest growth rate of SDP was experienced during 1981-94. The 1990-94 is the initial period of the new economic policy announced in 1991 at the national level. The growth rate remained the highest during those years. During this time Chimanbhai Patel was the Chief Minister of the state. However, it was on par with the rates achieved during the period 1981-85 during which Madhavsinh Solanki was the chief minister. However, it goes only to tell that the new national economic policy did not play a pivotal role in taking the growth rate to higher degree in Gujarat. It is quite interesting to note that the high economic growth rate was already achieved even befor the advent of new economic policy at the center. In fact, the growth rate achieved after 1995 was much lower than what was achieved during the earlier fifteen years. Note:1. Figures for 1980-81 to 1993-94 are at 1980-81 prices. 2. Figures for 1994-95 to 2008-09 are at 1999-2000 prices. 3. Rate of growth in 1994-95 is not calculated as it is the year when the base year was changed. Source: Socio-Economic Review: 1998-99, 2006-07, 2009-10, Budget Publication No. 30, 32 and 34. Note: Figures at prices of 2004-05.Source: Socio-Economic Review, 2011-12, Budget Publication No. 34, p: 33. Note: The growth rate of 2001-09 is at 1999-2000 prices and the growth rate of 2005-11 at 2004-05 prices. Another noteworthy fact was that the economic growth rate of Gujarat was not impressive in the first twenty years of the state though it was higher than 3.5 per cent, the so called Hindu Growth Rate of Prof. Rajkrishna, for the whole of India. Thus historically speaking, the growth rate of Gujarat has always been higher than the national average annual growth rate. It should not be, therefore, considered as an achievement of Narendra Modi’s regime and one should not be astonished by the propaganda machine of Modi. 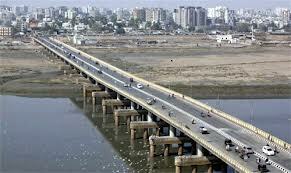 The higher rate of growth in Gujarat today, therefore, certainly does not provide any ground to boast about. Even the growth rate during the first decade of Gujarat i.e. 1961-71, was higher than the rate in the following decade to indicate that the growth had slowed down during the second decade. It showed a higher jump in the subsequent period. It can be seen from Table No. 2 that the growth rate of 16.73 per cent in SDP of Gujarat during the four years subsequent to the advent of the new national economic policy in 1991 was highest. Almost similar growth rate prevailed during the first five years of 1980s. It only indicates a considerable slowdown of growth subsequent to 1995. The SDP growth rate during 1995-2001 was virtually half of the growth rate experienced during 1990-94. Thus, the growth rate of Gujarat was the highest during 15 year period of 1981-95 when Madhavsinh Solanki, Amarsinh Choudhary and Chimanbhai Patel, (Kshatriya, Adivasi and Patel) ruled the state as chief ministers. Factually speaking, Narendra Modi’s regime could not scale that achievement. The average growth rate during 2006-11 went down below ten per cent. The claim that Gujarat developed only during the Modi era is thus a baseless claim. So far as economic growth is concerned, there is no great achievement during Modi period. In fact, there is a deceleration of achievements during his era and can be proved by the available statistical data. 1. During the first two decades since 1961, the contribution by the primary sector i.e. agriculture, fisheries, forest products and animal husbandry registered a slow fall, as it fell from 42 per cent to 34 per cent. In 1970-71 the contribution by farm sector virtually halved. However, there was no remarkable increase in the share of services. The share of service sector increased only by 6 per cent during this period. And of course, the share of industries increased by merely two per cent. 2. The period between 1997-98 and 2008-09 does not indicate any noticeable structural change in the state economy. The share of primary sector in the state economy decreased merely by 1.66 per cent during this period. Incidentally, the primary sector’s contribution to SDP remained almost the same. Even secondary sector did not indicate any noticeable change. The contribution of the manufacturing sector grew from 30.75 per cent in 1999-2000 to 31.08 per cent in 2008-2009, thereby a marginal increase of merely 0.33 per cent! However, the secondary sector decreased by 0.86 per cent. Source: Statistical Atlas of Gujarat Vol. II: Sectoral Profile. Bureau of Economics and Statistics, GOG, 1984, P: 2. 3. The secondary and tertiary sectors jointly contributed 81.98 per cent in SDP of Gujarat in 1999-2000. It went up to 82.24 per cent in 2008-09 indicating an increase of only 0.26 per cent. The Narendra Modi government has organized Vibrant Gujarat Summits of domestic and international investors in 2003, 2005, 2007 and 2009 and signed Memorandums of Understanding (MoUs) to claim the expected investments of Rs.1,80,668 crore in industrial and service sectors. Yet the contribution to these sectors increased merely by a quarter of a per cent. It shows that the claim that the economic development of Gujarat was achieved only during the Narendra Modi regime cannot be proved. 4. The above factors clearly establish that the noticeable structural changes in Gujarat economy were achieved during the period of 1980-81 and 1997-98 as the contribution of the agricultural sector went down from 34 per cent to 19.42 per cent and contribution of other two sectors increased from 56 per cent to 81 per cent. Source: Socio–Economic Review, 1998-99, 2007-08 and 2009-10. Director, Department of Economics and Statistics, Government of Gujarat. 5. It can easily be concluded from the above facts that contribution of the industries and services sectors to the State Domestic Product remained almost since 1997-98. Hence Gujarat cannot be described as industrial or services based state and it has not been agricultural based state at all. Of course, there were 30.49 lakh agricultural laborers and 49.11 lakh farmers in 2001 in the state of Gujarat. In other words, nearly 77.60 lakh persons are directly related to agriculture. They constitute 41.47 per cent of total work force of the state. The above mentioned facts and figures clearly indicate that the economic development of the state of Gujarat or the industrial and service sector development in the state is not a new phenomenon but it is a three decades old story. In fact, the solid foundation of the industrial development of the state was laid during 1980-81 to 1997-98, but solid foundation of the sustained economic growth of Gujarat was laid only during 1980-94. The economic structure of Gujarat did not undergo major changes in the first two decades since its inception. The changes began to occur in 1980-81 and were sustained thereafter till 1998-99. With this historical perspective, it can be said that the period of 1980-98 was the most important period for the industrial development of Gujarat and not the period that followed 2001 with Narendra Modi in command. Table # 6 shows analysis is not appropriate or averaged for convenience of a group. Under this scenario, the entire report remains a question. The analysis should be by using block of years or yearly. I have read your data.I came in Gujarat in 1973 after trasfered from Nagpur.Joined B.J.Mediacal college Ahmedabad B.J.Mediacl colleges.Was also the warden of one B.J.medical College during maximum agitation periods of Students. Transfer to govt.Mediacal College Vadodara in1988. Retired in 1995 and now settled in Vadodara. Please find out the data of Corruption in JnNURM projects of Center Government from December 2006 till date. In 2005-2006 the state was not having funds for develoments. All developments in Ahmedabad / Vadodara are from JnMURM Center Govt. funds. I can say about Vadodara Municipa lcorporation of Vadodara (VMSS) It is a hub of corruptions only with any civic facilities to its Vadodara citizen. Study the floods of Gujarat / Surat 2006 and Vadodara 2005 / 2006. Please also study the grants given by the Center Govt. to Gujarat State by the UPA 1 from 2004 to 2009 and UPA 2 from 2009 t0 2014. Come to Vadodara I will show you what is development.90% grants used are only papers. So Please find out how much corruption in Gujarat 5 JnNURM cities. Your eyes will be shut. and yoy will become 5 monkeys of Gandhiji i.e. wuill shut your eyes not to see wrong / close your years not to listen wrong and will close your mouth not to speak truth. All the Dveloment in Ahmedabad are from JnNURMgrant on the cost of poor people those are not provided alternate sites to be rehabilitated as per Hon.ApeX /.High court Orders and directives. As per UN guide lines the Project Effected Peoples’ (PEP) are to be rehabilitated on alternate sites. How many peoples are displaced in Ahmadabad with out rehabilitation’s on alternate sites?.From Sabarmati River Front Developments. How many EWS people’s rehabilitated those are removed from Banks of Sabarmati rive those were residing on banks of Sabarmati river from last 40 t0 50 years? Read 1994 policy of Gujarat Government that all the residents will be rehabilitated.They were given Cards also of their residence in Sabarmati River before to be removed from the River. The developments of Ahmedabad is on the cost of EWS poor peopes those are thrown on roads with out proper alternate sites. Thanks to development ICON of Gujarat.